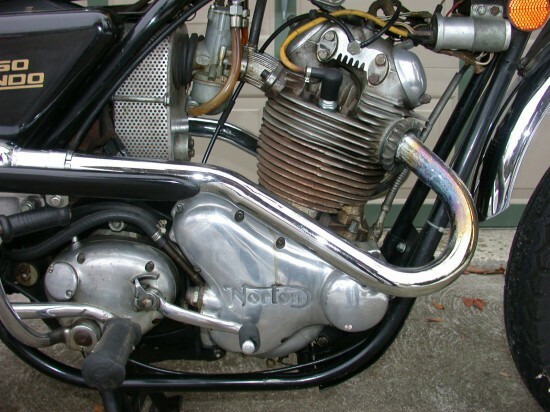 When I first saw this 1971 Norton Commando, with its front fender and high pipes, I thought it was a little different. When I read the SS 750, I knew something was different. 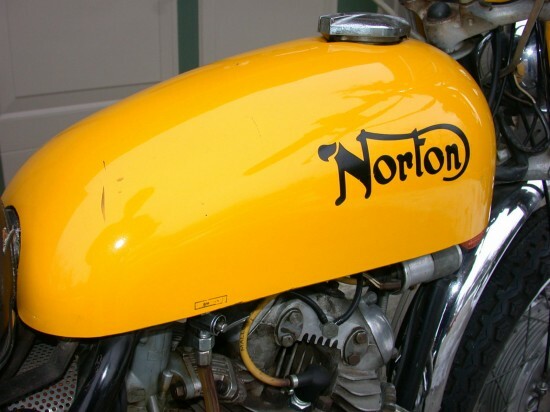 When ever I see a Yellow tank on a Norton, I think Commando, and I think road bike, with a lot of muscle. 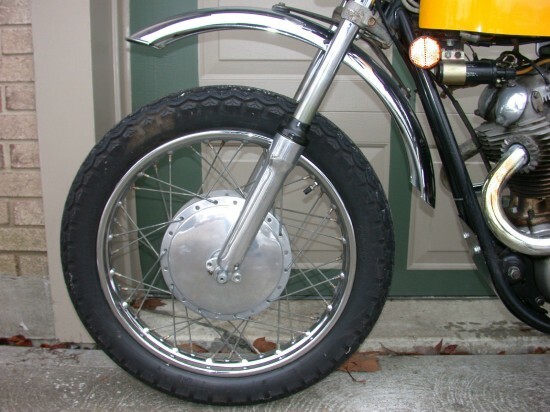 But with the ground clearance that the fender and exhaust gives this bike, I thought off road. 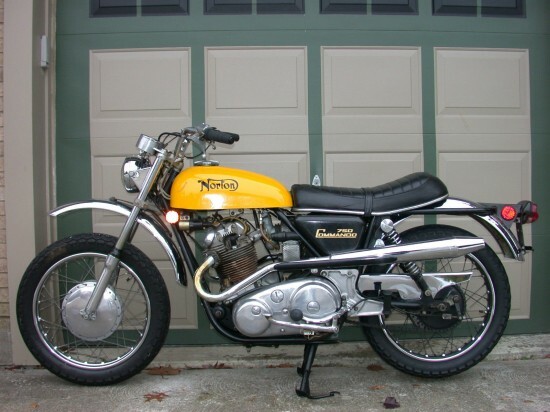 The US wanted bike to hit the trails, and Norton gave them what they wanted. This model was manufactured for only two months in 1971. It is a very rare bike. I purchased this bike in Albuquerque, New Mexico about 20 years ago. Bike runs well but could use a tune-up. This is a real SS with the correct pointy front seat, raised header pipes on both sides, raised mufflers, fiberglass leg guards, steel skid plate under engine and trail style handle bars. Frame is original paint. Tank is fiberglass with original yellow gel coat. Side covers are fiberglass with original black gel coat. Seat has some cracks in the seat cover. Seat cover is original. Tank has a slight crack on the front about halfway up which is sealed with clear sealant. I have another correct yellow replacement gas tank which will go with the bike. 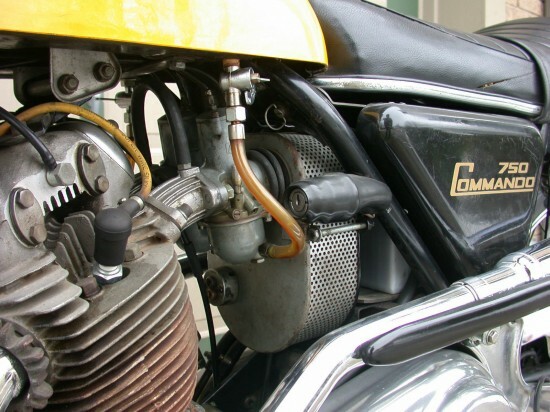 Has original Amal carbs and air cleaner. Has original points ignition system. Shifting is one up, three down and on the right side of the bike.Frame in good shape. Has newer model center stand. 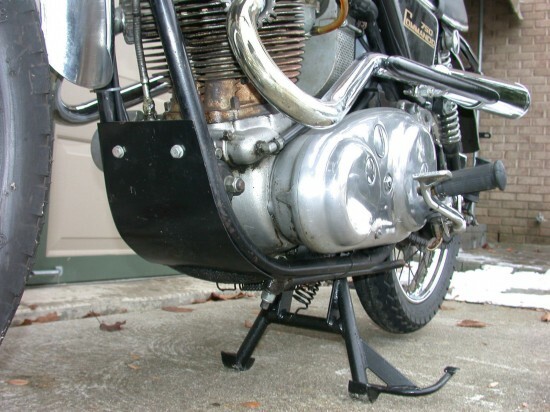 Side stand has been removed. Some small amounts flaked chrome here and there but not too bad. Mileage is not accurate. Header pipe show pitted and bubbled chrome on right side. Forks show wear in the usual spot. Bike runs well but tends to foul plugs after running a while. The SS stands for Street Scrambler, and this means that you can ride from your house to the trails, hit the dirt, then ride it home for a wash. Very little has been documented about the SS, with apparently little factory literature about the bike. It is thought that the SS tried to take some of the glory from the AMC P-10 desert sled, with more cosmetic changes then practical changes. 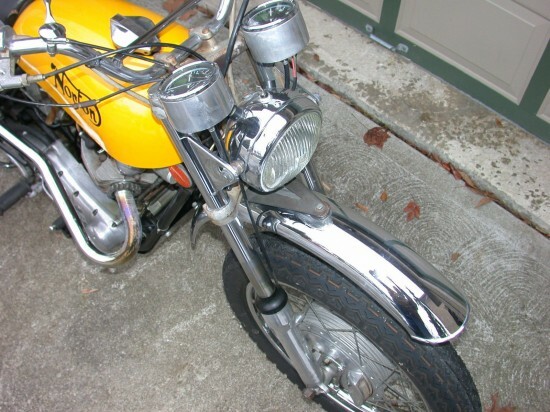 Smaller tank, shorter seat, smaller headlight, motor cross type handlebars and the high pipes. By the time the SS showed up in showrooms, the trend had changed, and these heavy, dressed up Scramblers were not moving. Some dealers stripped down the cosmetic parts, put on “normal” bars, tanks, seats and pipes and sold the left over bikes as road going Commando’s.